Milky Way Trail (7169) 08/01/1989 (J. Stahl) Single-semidouble white pansy. Medium green, heart-shaped, quilted. Semiminiature trailer. Unul din primele mele trailere. Imi place ca are denumirea galaxiei noastre, chiar amintesc aceste floricele albe pe fonul mai inchis al frunzelor de Calea Lactee. Am cam ignorat-o anul trecut. Anul asta are un loc bun sub soare, adica pe bara pentru perdea, agatat la geam. Sper sa iasa ceva frumos. Acum abia incepe sa se inverzeasca mai bine si a facut si floricele. Calea Lactee este galaxia gazdДѓ a sistemului nostru solar, a altor aproximativ 100-400 miliarde de stele cu planetele lor, precum И™i a peste 1.000 nebuloase. Toate obiectele din galaxie orbiteazДѓ Г®n jurul centrului de masДѓ al galaxiei, numit И™i centru galactic. Calea Lactee este un gigant, avГўnd o masДѓ de circa 750-1.000 miliarde ori mai mare decГўt a Soarelui И™i un diametru de aproximativ 100.000 ani-luminДѓ. Galaxia noastrДѓ face parte dintr-un grup de galaxii numit Grupul Local, format din 3 mari galaxii И™i un numДѓr de alte 30 galaxii mai mici, Г®n cadrul grupului ea fiind a doua ca mДѓrime dupДѓ galaxia Andromeda (M31). Andromeda, situatДѓ la aproximativ 2,9 milioane ani-luminДѓ, este cea mai apropiatДѓ galaxie mare. Galaxia noastrДѓ are forma unei spirale uriaИ™e; braИ›ele acestei spirale conИ›in pe lГўngДѓ altele И™i materie interstelarДѓ, nebuloase И™i stelele tinere ce iau naИ™tere permanent din aceastДѓ materie. Pe de altДѓ parte centrul galaxiei este format din stele bДѓtrГўne concentrate Г®n grupuri cu formДѓ sfericДѓ. Centrul galaxiei se gДѓИ™este Г®n direcИ›ia constelaИ›iei SДѓgetДѓtorului, la o distanИ›Дѓ de soare de 25.000-28.000 ani-luminДѓ. VГўrsta celor mai vechi stele din Calea Lactee a fost estimatДѓ recent la aproximativ 13,6 miliarde de ani, adicДѓ doar puИ›in mai micДѓ decГўt vГўrsta estimatДѓ a Universului (13,7 miliarde de ani). The Milky Way is the galaxy that contains our Solar System. This name derives from its appearance as a dim "milky" glowing band arching across the night sky, in which the naked eye cannot distinguish individual stars. The Milky Way appears like a band because it is a disk-shaped structure being viewed from inside. The fact that this faint band of light is made up of stars was proven in 1610 when Galileo Galilei used his telescope to resolve it into individual stars. 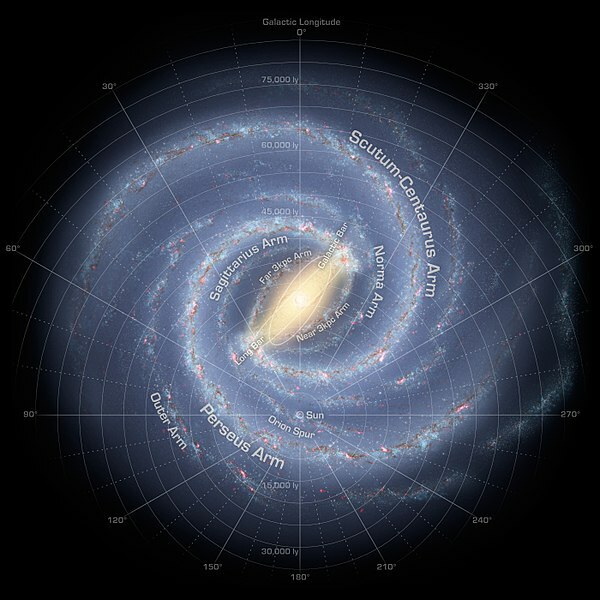 The Milky Way is a barred spiral galaxy 100,000вЂ“120,000 light-years in diameter containing 200вЂ“400 billion stars. It may contain at least as many planets. The Solar System is located within the disk, around two thirds of the way out from the Galactic Center, on the inner edge of a spiral-shaped concentration of gas and dust called the Orion Arm. The stars in the inner в‰€10,000 light-years are organized in a bulge and one or more bars. The very center is marked by an intense radio source named Sagittarius A* which is likely to be a supermassive black hole. The rotational period is about 200 million years at the position of the Sun. Surrounded by several smaller satellite galaxies, the Milky Way is part of the Local Group of galaxies, which forms a subcomponent of the Virgo Supercluster. When observing the night sky, the term "Milky Way" is limited to the hazy band of white light some 30 degrees wide arcing across the sky (although all of the stars that can be seen with the naked eye are part of the Milky Way Galaxy). The light in this band originates from un-resolved stars and other material that lie within the Galactic plane. Dark regions within the band, such as the Great Rift and the Coalsack, correspond to areas where light from distant stars is blocked by interstellar dust. The Milky Way passes through parts of roughly 30 constellations. The center of the Galaxy lies in the direction of the constellation Sagittarius; it is here that the Milky Way is brightest. Asta e pusa tot 4 pui in acelasi vas, Diana? De la asta am si eu un pui de la Myrela si are bobocei. Se pare ca nu prea se ramifica singurica asa ca va trebui sa o ajut dupa ce mai creste rupandu-i varful de crestere. Tot asa, Simona, sunt vreo trei cred. S-au mai deschis si alte flori. Oare reuseste sa ajunga la expo? Tine ea florile/bobocii doua luni?? Florile astea deschise - nu ajung pan la expo. Dar mai are alti boboci abia porniti, aia vor ajunge. pai ai vazut din ce "cascada" provenea! Daca as fi putut l-as fi luat si pe el, dar stiti chestia cu "spatiul"
Ocupa spatiu, dar sunt tare dragi cand le vezi pline de flori!